The first course they played in the rain was Rowallancastle a challenging course in any weather, but on a wet and wild October day, the team played 9 holes before heading in for a late lunch. Undeterred by the weather then next day, the team took up the next challenge at, The Irvine Golf Club, a tough links course, established in 1897, with stunning views over the Firth of Clyde to the Isle of Arran. The course was designed by James Braid, and is characterised by his creative use of the local landscape and the variety of challenges of each hole. Recognized by the R&A as a good test for any golfers, Irvine has regularly been used by the R&A as a final OPEN qualifying course and has co-hosted senior amateur and Ladies tournaments in recent years. The third and final course, which the team took on was Dundonald Links a new championship course, designed by Kyle Phillips and opened in 2003. 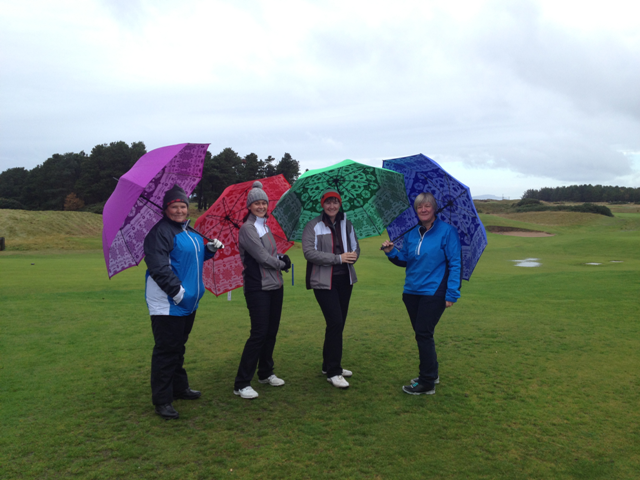 The weather proved a bit of a challenge but not for the team or their Gertie Brolly’s. This is a great picture. The colours stand out so much more on an overcast day. The brollies look great! !